At is at least a footnote to the late Alexander Haig's long and distinguished career that his missteps played an important role in the rise of the modern vice presidency. Haig gave a speech in which he announced that he was the "vicar" for foreign policy. The Reagan administration, watching the growth of the National Security Council and its head in the Nixon and Carter administrations, did seek to downgrade the National Security Advisor and elevate the Secretary of State. But Haig really could not play nice with the other kids and seemed to think he was President of Foreign Policy. He tried to tell Reagan what to do and he fought with the National Security Advisor over running the crisis management group at the NSC. The White House response was an interesting one. They gave the job to Vice President Bush. Giving into Haig would have looked bad and completely undercut NSA Richie Allen. But if Haig dug in his heels, Allen would not have been able to hold his own in bureaucratic combat with Haig. In giving the position to Bush the job went to someone that Haig didn't outrank. Bush, by most accounts, was quite capable in the position. His best performance was on the day Reagan was shot. Haig severely tarnished an impressive reputation with his performance that day, where he gave a press conference announcing that he was in charge. First off, he was actually wrong - succession does not go from the President to the VP to the Secretary of State (it did initially, but the Constitution was amended on this point.) The Speaker of the House and President Pro Tem of the Senate are in line first. Second, with the President and VP still alive succession does not occur at all. One can understand Haig's thinking. If the attack on the President were just part of a multi-pronged plan and enemies were to attack, someone would need to take command. But our ship of state is not ship, where someone has to be officially standing on the bridge. Vice President Bush, in contrast, was extremely prudent that day. He did not make excessive public statements and symbolically denied taking charge. When plans were made to helicopter him to the White House, Bush refused saying that only the President lands on the South Lawn. Bush took his motorcade to the Vice President's residence sending a signal to the American people that the government was functioning normally and not in crisis. Thanks to Haig, both in his battles to control foreign policy and his overstepping when Reagan was shot, Bush received expanded opportunities to participate in the administration. While Reagan and Bush met regularly and Bush had a clear line into the White House through the Chief of Staff, a long-time friend, Jim Baker, it was not clear that this would have allowed him to play a substantial role. He was not seen as an ideological Reaganite - coming from the other end of the party. While Mondale established the modern vice presidency, it might have died with the Carter administration's failure to win re-election. Instead Bush was given the chance to manage an important national security role and later took on other national security tasks such as the Terrorism Commission which set policy and the South Florida Task Force. The illustrious Christopher Hitchens illustrates some of my points about how Haig's power-grabbing led to George Bush's elevation to running the crisis management group. In other regards, Hitchens saw Haig as delusional and power mad (and he isn't alone in this assessment - the man worked with MacArthur and Nixon). He would probably think that I am being far too charitable to Haig and his infamous press conference. I still think Haig's military background, thinking that at all times someone has to be in the captain's chair, shaped the event. Veep v. veep has been an interesting Washington game – as Vice President Biden plays the central role in rebutting his predecessor’s argument that the Obama administration isn’t taking terrorism seriously. The merits of this discussion aside, the affair highlights some interesting aspects about the Vice President’s role. Administration spokesperson is a central VP role. But it has to be used carefully. Sending the VP is the PR/diplomatic equivalent of sending a battleship – it will make news worldwide. There is a reason it is called gunboat diplomacy, not battleship diplomacy. A battleship overplays the hand and if it falters it will trigger a major crisis – in the case of the VP the risk is that the administration will look stupid. Presidents and Vice Presidents are free, and expected, to address the public on issues. But Presidents do not directly debate administration critics, it is beneath the dignity of the office and there are ample surrogates (spokesman, cabinet members etc.) to do this job. Vice Presidents are also frequently deployed to deliver red meat speeches to the faithful and stump for local candidates (Nixon pioneered this role.) But that is different from directly debating with critics. So when do you send a battleship? When the other side has a battleship too. If the specific critic has national standing (which is rare since former Presidents are generally careful not to criticize their successors), the vice president, as the only other nationally elected figure might be the appropriate administration champion. The other prominent example of a VP taking on a specific critic was when Al Gore debated Ross Perot about NAFTA in 1993. Perot accused President Clinton of ”sending someone else to do your dirty work.” Perot had run a strong third in the 1992 Presidential elections (and in fact Clinton probably owed his victory to disgruntled Republicans who became Perot supporters.) The strategy paid off, Gore decimated a poorly prepared Perot. The converse of using the VP to counter a national level political critic is the rise of the role of the ex-VP as a possible national level critic. Tom Ricks is a well-regarded defense expert. But he also knows something about the vice presidency. 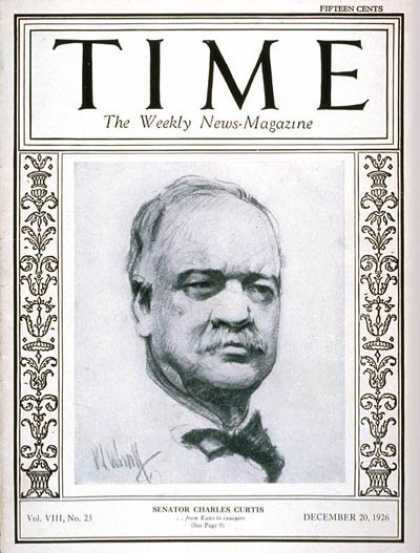 His recent post referred to Charles Curtis (Herbert Hoover’s VP, who is most famous for being part Native American) and compared his criticisms of FDR to Cheney's criticisms of the Obama administration. Curtis ended up being the last man standing in a leaderless rudderless party, so he became in effect the national figure – this despite has having little to do with the previous administration’s policies. The basic guide of bureaucratic politics is “where you sit is where you stand” or more academically – your position shapes your perspective. The VP has almost no inherent bureaucratic interests (with a relatively small staff and no core policy portfolio.) But the national standing does seem to count for something – maybe part of my thesis will be nailing down exactly what. It is worth noting that ex-VPs can’t always translate this into influence – Quayle for example. Obviously Quayle’s perceived shortcomings played a role, but so did the structure of the Republican party which is hierarchical and top-down. There is usually a pretty clear line of who get to be President in the GOP. Ford won the nomination in 1976, edging out Reagan. Reagan was next in line, his chief rival was Bush (who became his VP.) Bush’s chief rival and the "senior national Republican figure” was Senate Leader Bob Dole who won the 1996 nomination. Then there was a bit of a vacuum and W. won the nomination, edging out McCain – who was the nominee in 2008. Curtis had been a leading rival to Hoover and the Senate Majority Leader in his own right – he was next in line. But now, the Republican party is in a bit of disarray and Cheney is the last man standing - leaving him a platform to be critic-in-chief.